MashButtons: ARMY OF TWO: THE 40th DAY has a release date, and it's not what you think it is. 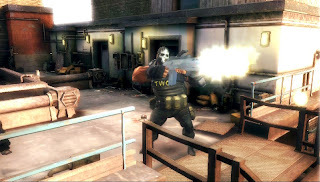 ARMY OF TWO: THE 40th DAY has a release date, and it's not what you think it is. If I was doing consultative work for EA's marketing team, I'd have suggested a Feb 9th release date for EA's ARMY OF TWO: THE 40th DAY. But that may have been too obvious. Instead, they went with a lower bidding consultant, and chose January 12, 2010 for North America and January 8th in Europe. I don't see ANY reference to 40 days in that release. Way to really confuse people EA! The sequel to the 2008 multi-platinum co-op shooter sees the return of the ultimate two-man private military team, Salem and Rios. 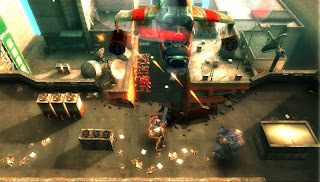 Trapped in the middle of Shanghai as it falls under attack, the two must work as a team to survive relentless enemy assaults and escape the city collapsing around them. Gamers who pre-order* ARMY OF TWO: THE 40th DAY now will have exclusive access to the game’s all-new explosive multi-player mode, ‘Extraction,’ at launch. This mode will be unlocked for all other players one month after the game ships. So if I understand that right, the game will ship with multiplayer on the disc, but won't be available for you to play for a month later (unless you preordered). I'm not sure if that's a pre-order bonus, or a penalty-free purchase. I understand access to a beta with pre-order, but a feature you paid for not available immediately? What do you think?